What’s the best dual-fuel portable generator? We’re here to help you find the right one for your needs. A dual-fuel generator gives you more options when fuel is scarce. In a world where we rely heavily on electricity to power the things that get us by on a day to day basis, the mere thought of being without it is terrifying. Thankfully, we have alternative means to power the things we rely on in the event that electricity is not an option – generators! Even better, a portable generator provides the convenience of power wherever you need it. There are a variety of types to choose from, but if you really want to get the most convenience and versatility then I would suggest a dual fuel portable generator. Think of all of the things you rely on electricity for every day – the refrigerator, the A/C, heating, etc. Now imagine getting hit by a storm that left you without power! A generator can do much more than simply provide a practical solution to keep the lights on. It could be a very valuable necessity. All generators consist of an engine which requires some type of fuel source in order to run whether it’s gasoline, liquid propane, diesel, or natural gas. The gas-powered generators are typically your most popular as they are more affordable. A dual fuel portable generator, however, is made to run on either gas or propane. Why does having this option matter? Most consumers have a fuel preference between gas vs. propane, however, having the versatility of choosing either-or can be very beneficial in the event that one of the two resources isn’t available. Let’s say there is a power outage. This is the most likely time that you will need a generator, right? If you are unprepared for a sudden blackout and have no gasoline readily available to run your gas-powered generator, you could be out of luck if the local stations are without power as well. What if you live in an area that may be prone to hurricanes or blizzards? A natural disaster such as either one of these can leave you without power for days. With a dual fuel portable generator, having the option of using one of two fuel options is like having two generators for twice the run-time. When one runs out, simply switch over to the other and you’re good to go. Another factor that should be considered when purchasing a portable generator is fuel storage and temperatures. Gasoline is often the popular choice because of its affordability. The downside to gas is that it has the shortest shelf-life since heat will cause it to evaporate. Propane, on the other hand, will last indefinitely. With propane, however, cooler temperatures that are below 40-degrees Fahrenheit will naturally cause it to contract, resulting in a drop of pressure in the propane tank. This drop in pressure may not give enough force to start up a generator on propane alone. A dual fuel portable generator gives you the best of both worlds with the option to run your unit on either fuel source during an emergency, no matter the climate. So for instance, you could store your unit during the summer months with propane and you’ll always be prepared if you run out of gas for a blackout or taking along on camping trips. During the winter months, you could start the engine of your dual fuel generator on gas and after a few minutes simply switch it over to propane. Are Dual Fuel Portable Generators Less Effective? Contrary to what you may think, a dual fuel portable generator option does not reduce the quality or the effectiveness of the amount of power you will get from running one of these. Whether you need it to run small power tools on a construction project, power up small appliances in your RV, or power the heating and cooling system of your home during a power outage, these will get the job done just as well as a single fuel generator. There is a wide range of options to choose from in sizes and output among these portable generators so it all depends on what your needs are. Connect your portable generator to your home circuit. Read the manual. While single fuel generators are the typical choice, dual fuel portable generators and even tri-fuel generators are becoming more popular due to their versatility. If you already own a portable generator, you can even purchase a conversion kit from certain companies that can transform your current generator to run on propane or natural gas. Keep in mind this is much more costly to do and you may need to buy additional parts to modify your generator for the kit. Unless your unit is fairly new, you’re best bet if you are wanting the benefit of two fuel choices is to just go out and buy a dual fuel portable generator. This is a common question that homeowners want to know, and rightfully so. It’s important to understand what total wattage you truly need. To determine that you should make a list of all the tools, appliances and other electrical devices you expect to run when your power goes out. Buffalo Tools, maker of the excellent Sportsman GEN7500DF, has an excellent guide to help you determine the right generator size for your needs. View or download the Generator Guide. It gives you a full breakdown of how much wattage different electrical devices require and it gives you a handy calculation table (below) to help you decide which generator size is best for you. Print it out so you can refer to it anytime or use the wattage table to calculate what you need. Excellent guide by Buffalo Tools on determining your generator size. ✓Note: LPG stands for liquid petroleum gas — also known as propane. 3 year limited warranty with FREE lifetime technical support. View or download the MANUAL for the Champion Power Equipment 76533. ✓Best for: Powering a fridge, lights, TV, other small appliance or a few household items. Noise level-68 dBA from 23 ft., noise Level- 68 dBA from 23 ft. Gasoline fuel tank 3.4 gal. This portable generator will give you the dependability you need in the event of an emergency with a powerful 4-stroke OHV engine that offers 3800 running Watts and peak Wattage of 4750. The power panel offers 4 total outlets with a 120v Duplex outlet, a TT-30 Amp RV outlet to power up an RV, and a 120v twistlock outlet. It has a 3.4 gallon fuel tank which will run for up to 8 hours on a full tank at 50% load. On a 5-gallon/20-pound propane tank, it will run for up to 5½ hours at 50% load. It comes with a 3.3-ft LP hose adapter with a regulator for hookup to a propane tank (not included). For safer operating, there is a fuel selector switch on the unit to select gas or propane. It also features a low oil sensor, overload protection and features an ‘Intelligauge’ to give you information on the volts, hertz, and operating hours. It has an electric start with the battery included to start up right away on either fuel choice as well as a recoil start if the battery isn’t charged. It does require some assembling to put the wheel kit together, as most do, for portability as well as the handle and hookup for the battery. No worries, it is fairly easy to put together. The wheel kit has a really durable frame with 8” wheels on it and the handles conveniently fold away. The dimensions of the generator with the wheel kit are 26 inches in length, 24.8 inches in width, and 22.9 inches in height to give an idea of the actual size of the unit. This would be ideal for running an RV on weekend trips to power the air conditioning as it comes equipped with a TT-30 RV receptacle. Or you could simply run a refrigerator and an A/C window unit to keep food from spoiling and maintain a reasonable temperature during a blackout. One really notable factor with this portable generator is that unlike your larger units, this one weighs just a little over 100 pounds for optimal portability. Even with a wheel kit, there may be times that require you to lift the entire unit, such as loading it in the back of a pickup truck! LPG hose with regulator, 3.3 ft.
196cc engine rated at 7 HP. View or download the MANUAL for the DuroMax XP4850EH dual fuel portable generator. When it comes to portable generators, DuroMax is one of the leaders for innovation. This 7-horsepower engine has a full power panel that will give you the power you need to run your necessities when disaster hits, leaving you in the dark. It can deliver a constant output of 3,850-Watts and a maximum output of 4,850-Watts. On the power panel, there are two standard 120v 20-Amp 3 prong outlets and a 120v/240v 30 amp twist lock to run your basics in the unfortunate event that a storm causes a power outage. The 4-gallon fuel tank will give you about 8 hours of running time on 50% load. There is a fuel gauge and a low oil indicator that can both help you to extend the life of your dual fuel portable generator. The entire engine sits on a durable frame with a wheel set for portability and even features motor mounts on each corner to reduce the amount of noise while the generator is running. It also has a quiet exhaust. The only assembly required is for the frame of the wheel kit and handles which is pretty straightforward. The unit comes with the instructions as well as the hardware that you’ll need to get it assembled and running. Additional features to mention: there is an auto idle control feature on the unit and it will automatically shut-down when low oil level is sensed. When running a portable generator you can expect it to be loud. However, this one isn’t terribly obnoxious with a decibel rating of 69. To put this into more perspective for you, it is about as noisy as your average lawnmower. It’s a sound you will be grateful for when you need it most. Similar to the Champion unit previously mentioned, this generator set is a bit on the lighter side at a maximum of 130 pounds, which is helpful on the back when wheeling it around. Completely assembled, the dimensions are 36 inches long, 21 inches wide, and 24 inches in height. I should note, this particular unit is not CARB-compliant (California Air Resource Board); however, it is EPA-approved which means it’s perfectly safe for use in national parks should you wish to take it along on a camping trip. Just don’t run the unit in a closed-in garage – which should be common knowledge when it comes to generator safety use and carbon monoxide. This is the only dual-fuel inverter generator, which is an excellent compact generator that runs on either gas or propane. As quiet as a conversation at 59 dBA. Inverter generators have a lot of advantages over conventional gas generators. They are much quieter, which most consumers appreciate. Let’s be honest, generators are generally loud and annoying, unless they are true inverter generators. This is a huge advantage. Also, inverter generators also produce clean power which means you can power all of your sensitive electronics safely. Because of these advantages you’ll notice that inverter generators are more expensive when comparing watts, but in my opinion, they are worth the money. We’ve written a comprehensive review of the Champion 100263 that I recommend you read if you’re looking for an inverter dual-fuel generator. Electric Start with 3-Position Ignition Switch. Cold Start Technology ensures a quick start in cold weather. Clean Power for Sensitive Electronics (˂ 3% THD). Easily switch fuels with a quick turn of the fuel selector dial. Will run for 7.5 hours at 25% load. Smart Economy Mode, which can reduce the electrical load, providing quieter operation, extended engine life and better fuel economy. Outlets : 120V 30A RV (TT-30R), two 120V 20A household outlets (5-20R), a 12V DC automotive-style outlet with dual USB adapter, plus a propane hose with a built-in regulator. Optional Champion Parallel Kit provides a quick clip-on connection which allows you to increase output by connecting up to two 2800-watt or higher inverters. Also included is a standard 50-amp RV outlet with power to start and run two 15,000 BTU RV air conditioners. 3-year limited warranty and FREE lifetime technical support. ✓ View or download the MANUAL for the Champion dual fuel inverter generator (model: 100263). 11,000-Watt 120V/240V Dual Fuel Portable Generator. CARB Compliant. An excellent heavy-duty generator for the money. 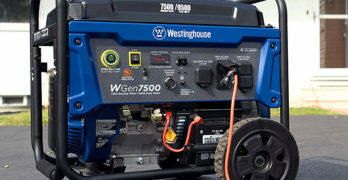 ✓ Read our full review of the Wen DF1100 (11Kw Portable Generator). Backed by a nationwide network of skilled service technicians, a friendly customer support phone line, and a two year warranty. 18 HP / 10,000 watts / 419cc — This is one of the most affordable and popular dual-fuel generator you’ll find. DuroMax offers a lot of great features, with great reliability, at a very affordable price. Runs on liquid propane or gasoline giving you flexibility during an emergency. ✓ View or download the MANUAL for the DuroMax XP4850EH dual fuel generator. Use regular gasoline or liquid propane. Perfect for emergencies when gasoline is scarce. Equipped with low oil protection, AC and DC regulators, and a spark arrestor. Dependable DuroMax 18hp engine with cast iron sleeve and steel bearings maximize engine life; rated ac output: 8000 watts; max ac output: 10,000 watts. Full power panel with advance oil warning light, key start switch, volt meter, circuit breaker and power outlets. Super quiet exhaust, 72 dba measured from 7 meters w/ built-in spark arrestor. EPA Approved Engine. Not available for shipment to California. ✓If you want something smaller and less expensive then you might be interested in the DuroMax XP4400EH which is also a dual fuel generator. It’s rated at 4,400 watts (7 HP). If you’re looking to step it up a notch, this powerhorse of a portable generator may be more up to speed. It has an 18-horsepower engine with an 8000-Watts rated AC output, 10,000-Watts maximum AC output. It contains two 120v 20mp 3-prong outlets, a 120v 30 amp twist lock outlet, 120v/240v 30 amp twist lock outlet, a 120v/240v 50 amp heavy-duty outlet, and a 10a 12v outlet to give you optimal usage to power up whatever you need. It can switch over from gas to propane-fueled power in a matter of seconds and contains a flexible hose that will connect to any size propane tank. The electric start key is really easy to use to get it going and it also has a recoil starter. There’s also a low-oil indicator that shuts off the generator to protect the engine. The fuel tank holds just a little over 8 gallons and the unit can run for a maximum of 10 hours on either gas or propane (this is based on a 20-pound propane tank you typically use to BBQ with and may vary on the size of the propane tank you’re using) at 50% load. It comes equipped with both AC and DC regulators. At 10,000 watts this generator gives you plenty of power to run heavy electrical loads at the same time as small appliances. The tires are Solid-Fill, which means they won’t go flat on you. This is really beneficial when storing the unit for an extended period of time. The last thing you’d want when the power suddenly goes out is a portable generator that is not so portable as a result of flat tires, especially considering this big boy weighs a hefty 255 pounds! It’s also considerably larger than the other generators with dimensions of 40 inches in length, 29 inches wide and 32 inches in height. This may be something you will need to factor in when determining where your portable generator will be stored. Is a Dual Fuel Portable Generator right for You? Buying a generator in the event of a major power outage is not likely something people often think about, but should you experience one you’ll be glad to have one of these on hand. Keep in mind, these aren’t intended as whole-house generators that automatically switch on in a power outage. They must be manually turned on either by turning on the electric start switch or pulling a recoil starter. If you frequently experience power outages where you live for extended periods of time then you may want to consider a whole-house generator, but I won’t get into that. A portable option can offer far more versatility for multiple uses. Whatever the circumstance may be from being prepared for emergencies or to run a camper for outings, a dual fuel portable generator will provide you with great convenience for your needs. Having the option to choose among the two fuel types ensures that you will always be prepared. So whether you’re a gasoline or propane type of person you have the flexibility to choose! Good balance between cost, power and features. Great value. View or download the MANUAL for the Smarter Tools ST-GP7500DEB. ✓Best for: Power your refrigerator, well pump, microwave, heater blower and lights. 9 hours at 50% load on 6.6 Gallons of Gasoline. 389cc 4-stroke Air cooled OHV motor. Four 120V 20A outlets, a 120V 30A Twist-lock AC (L5-30R), a 120/240V (NEMA L14-30R) 30A Twist-lock outlet, and one 12V 8A DC-Multiple options for providing power. Overload protection: Protects the generator and your appliances. 73 dB Noise level : Quiet Operation spark arrest muffler. Low oil shutdown : Extend the life of your generator. Digital Hour/Volt/Hz Meter : Hour meter-Keeps track of run-time for scheduled maintenance and Volt meter-Assures correct voltage for your appliances. Fuel gauge-Easily know when you need to add fuel. 10” No-Flat wheels and handle kit-Easy portability. The 71531 is discontinued. The 100155 model is identical, but the output is slightly lower at: 7000 rated watts and 9000 starting watts. Everything else about these generators is the same. Note: On Amazon, it’s labeled as the 100165, which is incorrect. Learn more on the Champion Power Equipment site. Dual Fuel Technology with Fuel Select Switch for safe fuel conversion between gasoline and propane/LPG gas. Will run up to 8 hours on gasoline on full tank of gas (6.1 gallon tank) or run for up to 5 hours on propane/LPG 20 lb./5 gallon tank at 50% load (propane tank not included). Includes 3.3’ propane connection hose with regulator to connect propane tank to generator. 439cc OHV engine with Cast Iron Sleeve for durable. Includes low oil shut off sensor, Cold Start Technology and Quick Drain oil system. Electric start with 12V 15Ah Battery (included) for easy one-touch push button starting. Has a battery maintenance charging adapter to keep battery charged when not in use or stored. Less than 5% THD (total harmonic distortion) Alternator provides pure sine wave to power sensitive electronics like computers, TV’s, laptops, furnace fans, etc. Heavy duty 1.375” steel frame with isolation motor mounts makes it quiet when operating. Intelligauge: Digital meter that measures Hour/Volt/Hz, to keep track of run-time for scheduled maintenance. Quick drain oil hose for easy oil changes (recommended every 50-100 hours of operation). Automatic voltage regulator for overload protection that protects the generator and your appliances. EPA and CARB Emission Certified (50 States). View or download the MANUAL for the Champion Power Equipment 100155. View or download the MANUAL for the Champion Power Equipment 71531 generator (discontinued on Amazon). Designed with fuel safety in mind. Specially designed fuel selector switch’s safety feature only allows the operator to select and use one type fuel at a time. Using only one type of fuel at a time is for the operator’s safety. *To ensure a safe connection, contact a local installer of larger LPG cylinders if you plan on using an LPG cylinder larger than a standard 20 lb. or 30 lb. unit. Runs for 9 hours on full tank of gas. Champion Power Equipment’s dual fuel generators were designed to use only two (2) types of fuels, Gasoline (petrol) and LPG (liquid propane gas). The engines are also certified to specific emission standards for both fuels, so any modification of the generator and/or engine to any other type of fuel may VOID the warranty. Temperature impacts your generator running time, as well as oil use and consumption. Champion Power Equipment designs all of its motors with a low oil shut-off feature that will instantly shut off the engine if the oil level falls below a certain threshold. Under normal temperature operating conditions, regular 10W-30 automotive oil is recommended. For specific temperature ranges and oil type use consult the owner’s manual. Runs quiet at less than 80 dB. View or download the MANUAL for the Sportsman GEN7500DF.